If you need both a DSLR backpack and a GorillaPod, Adorama has bundled them together for $120 with free shipping and handling: the Incase DSLR Pack Nylon Camera Backpack along with the Joby GorillaPod Mini Tabletop Tripod. From a $6 cup we now go to the other end of the price spectrum! For a limited time, you can get FREE Fuji co-branded Domke F-803 camera bag when you purchase select Fuji cameras and lenses at Adorama and B&H Photo at their regular prices. The Fuji products that are eligible for this promotion mention the free bag on their individual product pages. No coupon is needed, the price will be adjusted automatically in the shopping cart. On its own, the Fuji co-branded Domke bag goes for $230, but the standard Domke F-803 goes for $130+ on its own (eg various at Amazon). More B&H action, they are featuring until Saturday 12/30/17 a soccer team (eleven) Canon 5D Mark IV bundles with a variety of FREE accessory bundles. One of the offers is a PIXMA MIR bundle. The rest are “Add to cart” and checkout, no coupon, no rebate. Prices range from $3200 to $3949. All bundles except for the Pimxa bundle get FREE NEXT DAY delivery! PS: B&H customarily closes every Friday PM to Saturday PM, so plan your purchases accordingly! Don’t wait until the last minute! We have a union of the two discounting towers: coupon and mail-in rebate! Coupon code CA2DTVSFA drops the price of the bundle by $350 and the mail-in rebate gets you a $350 prepaid AMEX gift card by mail, dropping the on-page price of $3549 to $2849 after the coupon and after the mail-in rebate. The Adorama bundle is the Canon 5D Mark IV body + Canon BG-E20 Battery Grip + Pixma PRO 100 printer and of course its trusty sidekick the SG-201 photo paper (50pk 13×19 inch). As mentioned in the Flashpoint posts you can enter/test the coupon without logging in or creating an account. Enter the coupon in the payments section and if asked enter an email address in the email box above. Then you’ll see the price drop from $3549 to $3199 after the coupon. A few weeks AFTER you receive the order and file the mail-in rebate, you will receive a $350 prepaid AMEX gift card by mail, making it a $2849 after the $350 MIR. Adorama is offering a Canon D-Rebel T6i with 18-55 and Pixma TS9020 Printer bundle for $599 with free expedited shipping, along with 4% promotional rewards ($24 to be spent in future Adorama purchases). The printer is included automatically, no coupons, no rebates. This is not the Pixma mail-in rebates. You just add the whole thing to the shopping cart and proceed to checkout. This is another “deal survivor”: offers that went live during Black Friday and Cyber Monday and still continue! The expiration date for this incarnation is Saturday 12/2/17 at 11:59pm ET, but keep in mind, B&H Photo does not accept orders between Friday PM and Saturday PM, so plan accordingly! It is in-stock and ready to ship as of the time of writing! If you are not afraid of mail-in rebates, B&H Photo has a 6D Mark II Body Bundle for $1349 after a $350 mail-in rebate (prepaid AMEX GC). You get the 6D Mark II body only, the Canon BG-E21 battery grip, the Pixma PRO 100 printer and its 50pk SG-201 paper sidekick, a 64GB Sandisk Extreme SDXC and an extra Canon LP-E6N battery. + NOTE: the above two bundles come with different 24-105 lenses, so if you are switching between the various listings, make sure you are looking at the correct 24-105 lens bundle when you are ready to order. These three bundles have the same price deltas in-between them as do the the three standard kits of $1699 (body) and $2099 (+$400) w/24-70 f3.5-5.6 and $2599 (+$900) with 24-105 f4L. It is in-stock and ready to ship as of the time of writing! If you are not afraid of mail-in rebates and prepaid gift cards, B&H Photo has a Canon 5D Mark IV body only bundle for $2849 after a $350 mail-in rebate (prepaid AMEX GC). For that you get the Canon 5D Mark IV body only, the Canon BG-E20 battery grip, the Pixma PRO 100 printer and its 50pk SG-201 paper sidekick, a 64GB Sandisk Extreme SDXC and an extra Canon LP-E6N battery. These three bundles have the same price deltas in-between them as do the the three standard kits of $3199 (body) and $3949 (+$750) w/24-70 and $4099 (+$900) with 24-105. The Canon 7D II body only goes for $1500 at authorized dealers (eg B&H Photo and Adorama) or for $1550 bundled with the Canon Wifi kit (eg Amazon itself and B&H Photo). PS: if you are interested in the 7D II with the 18-135, there’s a parallel offer for $1599 after $350 MIR. The Canon 7D Mark II with the 18-135mm lens and the Wifi adapter kit goes for $1950 at authorized Canon USA dealers. Without the Wifi adapter kit, you can get it for $1850 at Adorama in new condition and with a free extra battery. If you are a fan of imported grey-market cameras, you can get the 7D II with 18-135 in new condition (without the Wifi adapter) for $1409 with free shipping by 6ave on eBAY which includes a 1-year warranty provided by 6ave (not Canon USA). PS: if you are interested in the 7D II body only instead, there’s a parallel offer for it for $1199 after $350 MIR. UPDATE: as of late Tuesday 11/28/17 re-check, this offer is still good! Last Call for this offer, it ends on Monday at 11:59pm ET. 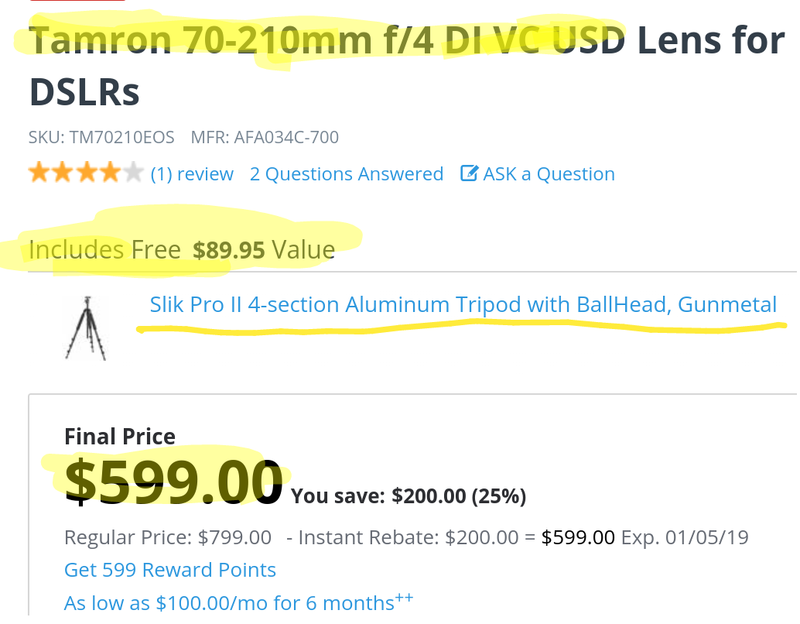 It is back-ordered but you can place the order if you like the price/combo: If you are not afraid of mail-in rebates, B&H Photo has a 6D Mark II Body Bundle for $1349 after a $350 mail-in rebate (prepaid AMEX GC). You get the 6D Mark II body only, the Canon BG-E21 battery grip, the Pixma PRO 100 printer and its 50pk SG-201 paper sidekick, a 64GB Sandisk Extreme SDXC and an extra Canon LP-E6 battery. Last Call for this offer, it ends on Monday at 11:59pm ET. It is back-ordered but you can place the order if you like the price/combo: If you are not afraid of mail-in rebates and prepaid gift cards, B&H Photo has a Canon 5D Mark IV body only bundle for $2849 after a $350 mail-in rebate (prepaid AMEX GC). For that you get the Canon 5D Mark IV body only, the Canon BG-E20 battery grip, the Pixma PRO 100 printer and its 50pk SG-201 paper sidekick, a 64GB Sandisk Extreme SDXC and an extra Canon LP-E6N battery.